Day 8 of the murder retrial of Dennis Oland in the 2011 bludgeoning death of his multimillionaire father Richard Oland gets underway in Saint John today. In #SaintJohn court, ready for Day 8 of Dennis #Oland 's 2nd-degree murder retrial to begin. Court of Queen's Bench Justice Terrence Morrison is seated. Court is in session. Day 8 of the trial of Dennis Oland in the murder of his father Richard. 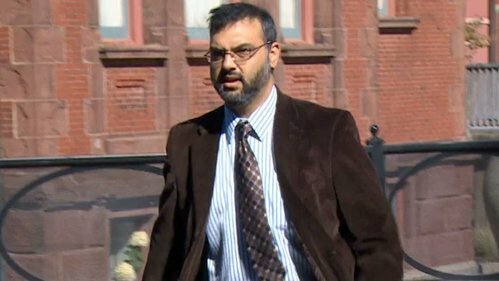 Crown prosecutor Jill Knee calls pathologist Dr. Ather Naseemuddin to the stand. He performed the autopsy on Richard Oland. Crown prosecutor P.J. Veniot advises the court they intended to recall head of forensics Sgt. Mark Smith this afternoon, but he's "seriously under the weather" and sought medical attention over the weekend. Veniot says he made an executive decision, given the condition that he's in, to tell him not to attend court today. Dr. Naseemuddin briefly outlines his background. Says he has performed up to 300 autopsies in his career. Judge agrees to declare him qualified to give opinion evidence on the "cause, manner and mechanism of death." Warning: some of this evidence could get graphic. Court will be seeing some graphic photos too, judge advised. Naseemuddin going over typical steps of an autopsy - external examination of body, take notes of findings, clothing and personal effects removed, naked body examined "head to toe, front to back." Toxicology samples of eye fluid, urine and blood, Xrays etc. Naseemuddin says he reviewed some of the crime scene photos to get a sense of what he was dealing with. Richard Oland's body was face down in a large pool of blood. "Looks like there are a lot of injuries to the head," pathologist says. Dr. Naseemuddin says he went to the morgue where Oland’s body was taken and met with two police officers who showed him some crime scene photos to give a sense of what he would be dealing with. Naseemuddin waited "more than a couple of hours" as head of forensics Sgt. Mark Smith and forensic Const. Dave MacDonald collected any evidence from the body - fibres, bloodstains etc. Police remained during the autopsy - one taking photos as directed by Dr. Naseemuddin the other taking notes as dictated by the doctor. Naseemuddin says Oland had “way too many injuries” for him to keep track of for a later report. Officers were helpful he says. Some of the wounds were superficial - cuts to skin. Some were "slightly deeper," while others went through the full thickness of the skin and tissue and broke the underlying bones as well, he says. Looking at photos now. First injury is under the right eye - a blunt injury that broke the orbital bone beneath the eye. Made with a blunt instrument “without a sharp edge on it” says Naseemuddin. Next - injuries to Oland’s hands. Two slicing injuries on left hand, one on the top of a finger and one on the back of the left hand that also breaks bone. Three slicing wounds on the right hand. These also break bone but are sharp force injuries, he says unlike the blunt force injury under the eye. Hand wounds likely “defence injuries” as Oland initially responds to attack suggests Dr. Naseemuddin. “You are trying defend your body from attack,” he says of typical hand wounds. Naseemuddin says hand injuries would be “excruciatingly painful” but surmises Oland was quickly incapacitated given there are few hand injuries compared to the volume of head injuries. He decided to start by documenting the injuries to Oland's hands first because there were fewer of those. They would not have been rapidly fatal, but would have caused "excruciating pain and a lot of bleeding," he says. Moving on to the head injuries. Pictures are frankly horrifying. Multiple deep gashes, some which have penetrated the skull. Multiple skull fractures he says. Numbers do not represent sequence of injuries, but wounds to hands are self defence-type wounds. Naseemuddin marks each injury with numbered pieces of tape to keep track of what he is seeing. “First time I was dealing with so many injuries,” he says. #3 , #4 and #5 all on right hand. One of them, the weapon used went through the back of the hand and came out on the palm side, he says. Those are "sharp force" injuries. #8 to Oland's head is a "blunt force" injury. Circular shape measuring about 2 cm in diameter. Appears to have a cross-hatch pattern, he says. No mention of possible weapon yet. No weapon was ever found, court has heard. Some wounds fractured Oland's skull, court hears. Skulls have 3 layers. Thickness varies depending on area of skull (eg. temporal area thinner than top), but average is about 1/2 cm, he says. Court on morning recess.